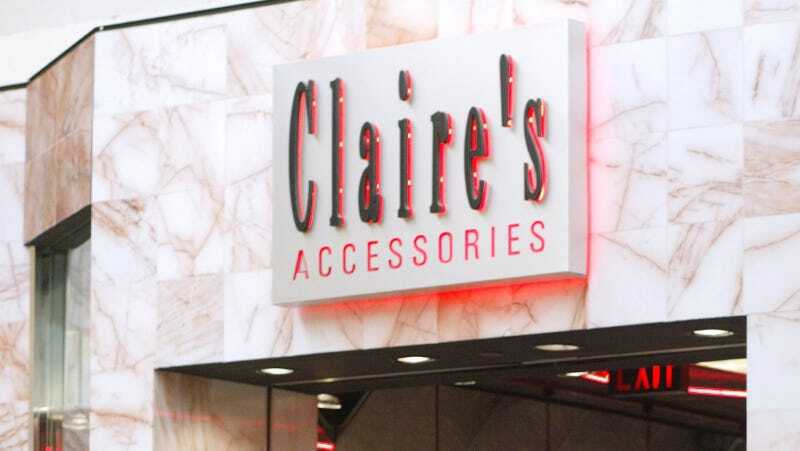 Claire’s Accessories, the go-to place for powerbeads in every color, is filing for bankruptcy. Bloomberg reports that anonymous insiders have confirmed the company will be solidifying their Chapter 11 filing in the coming weeks. The extreme measure is an effort to ease the company’s debt of 2 BILLION dollars. That is ten times a “key measure of its annual earnings” and they have an interest payment bill of $60 million due March 13. How has Claire’s gotten into this situation? Is it all the shoplifting I did when I was in middle school? No. It’s the death of malls. Like all our teen franchises that built a brand on bored kids wandering over from the food court, Claire’s has had to contend with “declining customer traffic and online competition.” They’ve been driven to hawking their merchandise at CVS pharmacies and Giant Eagle supermarkets. How can you establish intimacy in your girlfriend group in the aisle of a CVS? Will a CVS employee give me three ear piercings I haven’t used in 20 years? Probably, if I pay them enough, but it’s not the same! Farewell to the institution that suggested we wear several successively smaller silver hoops in a row in our lobes and a choker and why not some chunky plastic flower rings? Butterfly clips holding down your hair twists on top, a dash of body glitter, and you have fashion. No other place so completely encapsulated the look that is currently coming back into vogue, yet we can’t even keep them in business. RIP Claire’s. You’re just too real. What Are You Buying to Mourn American Apparel?